If you haven't camped before (or want to update or augment gear you already have), you can shop for everything you need online. The basics are simple: a tent, a tarp, and sleeping gear. The following are all reputable sellers. REI (visit site) is a one-stop shop that can outfit your outdoor travel and camping with the latest gear, clothing, and footwear. The company even sells boots and packs for your dog and also leads camping and active adventures. Paragon Sports (buy gear online) can help to equip you with just about everything you need for a honeymoon camping trip. It stocks tents, compasses, cookware, sleeping bags, lanterns, and offers a variety in each category. And the airbeds (along with pump) can change a rocky night to a dreamy one. Maps.com (order maps online) has what you need to plan your route in advance and lead the way when you're on site. Magellan's (search for gear) carries specialty items, ranging from flashlights and rainwear to solar power packs and insect repellant. If you need luggage as well, Zappos (shop online) provides a vast selection. If none of those situations faze you, then an outdoor honeymoon is probably a great idea for the two of you. Go forth and pitch your tent. Imagine someone else setting up your tent under the stars, sheathing your bed in luxury linens, building a fire for you, cooking a gourmet meal that you've specified, cleaning up, and then departing so you can enjoy the rest of the evening alone together... that's glamping, a portmanteau for "glamorous camping." 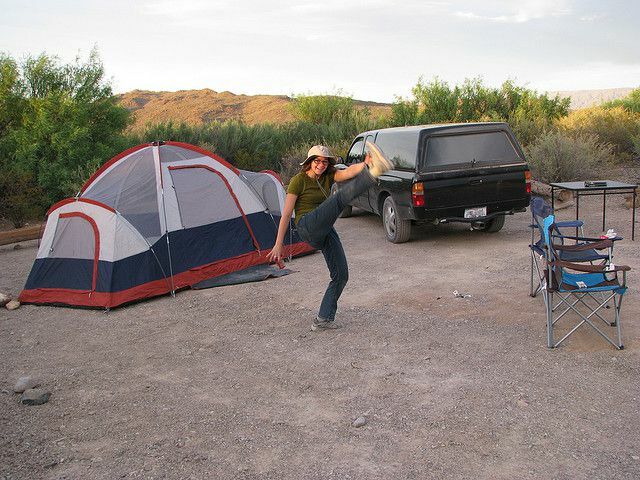 If you've resisted going camping to avoid bugs, dirt, using nature as your bathroom, and having to cook for yourselves, going glamping will get you outdoors without having to deal with the unpleasantries. It's a comfortable way to enjoy the outdoors without getting your hands dirty. Luxury resorts that possess large tracts of land are good prospects for glamping. At Montana's Resort at Paws Up, for example, couples can overnight in an oversize, safari-style tent with a feather bed, copper bathtub for two, ensuite bathroom and air conditioning from late May through September. Adult-only Honeymoon Tents are set aside for couples who don't need any one else around, except for the camping butler who delivers and presents your meals. If you're interested in a glamping vacation, you can experience one around the world. Search for your next rustic, romantic, but not really rugged getaway at Glamping.com. Another alternative: Rustic Romantic Retreats. Although you'll have shelter and perhaps some luxury amenities, these faraway places can be the sweet spot between camping and glamping.